It begins with the tradition of using small candles to light up the Xmas tree. Candles for the tree were glued with melted wax to a tree branch or attached by pins. Around 1890, candleholders were first used for Christmas candles. Between 1902 and 1914, small lanterns and glass balls to hold the candles started to be used. In 1882, the first Christmas tree was lit by the use of electricity. Edward Johnson lighted up a Christmas tree in New York City with eighty small electric light bulb. 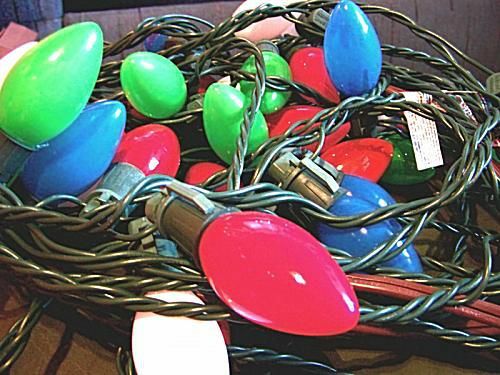 It should be noted that Edward Johnson created the first string of electric Christmas lights that were then mass produced around 1890. By 1900, department stores started using the new Christmas lights for their Christmas displays. Edward Johnson was one of Thomas Edison's muckers, an inventor who worked under the direction of Edison. Johnson became vice-president of Edison's electric company.